Swiss luxury watch brand RJ-Romain Jerome unveils a new timepiece in collaboration with HardNine Choppers, a Swiss based custom motorbike manufacturer. This artistic package contains a subtly luxurious and unique timepiece as well as a one of a kind motorbike under one common denominator: H9C-DNA. Sold only in a pair, these two unique pieces share common design traits such as purple metal flake paintings, golden components, perforated leather and skulls which are strong biker symbols. 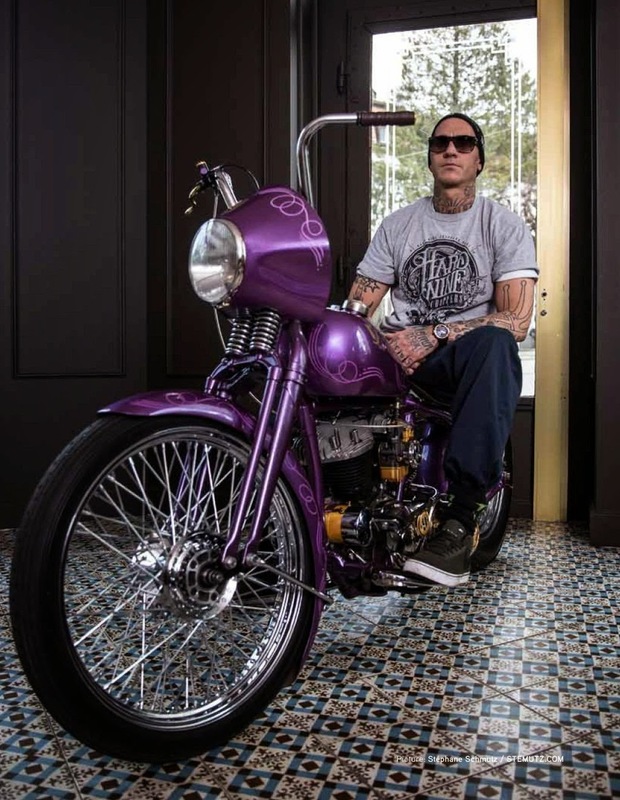 Danny Schneider is the owner and founder of HardNine Choppers. He launched his company in 2002 after a severe FMX accident that put an unexpected end to his career. He was known to be one of the pioneers in Swiss FMX and has now established himself as a one-of-a-kind custom motorcycle builder. The first part of this incredible custom set is the H9C-DNA timepiece. Housed in a see through 44 mm black PVD-coated steel case, the watch features a red gold bezel with matching hour and minute hands. The generous yet refined case nests a complex five layered skeleton movement that highlights the angled bridges recalling the intricate structure of a V-Twin motor. 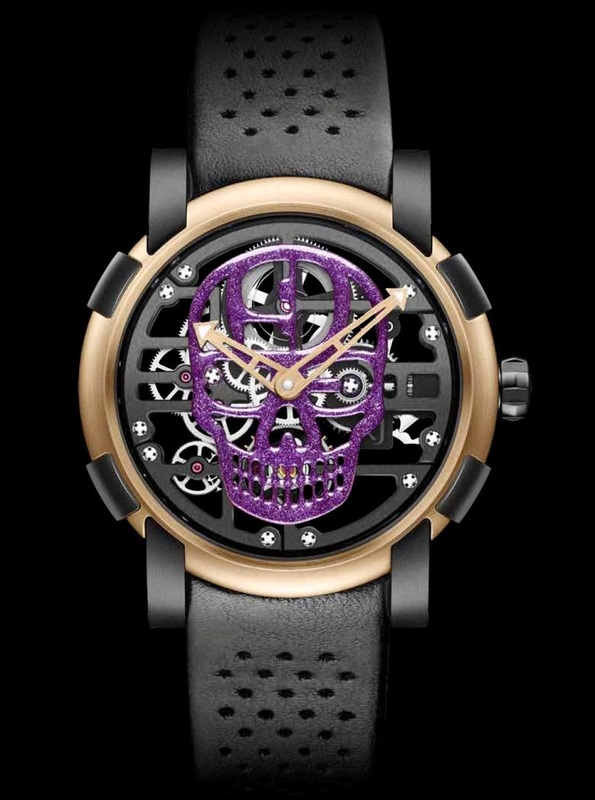 Immensely eye-catching, the skeletonised Skull has been delicately applied on the dial, and hand painted in a unique purple metal flake colour allowing the barrel to be seen through H9C’s skull logo depicted on its forehead while the balance wheel is discreetly tucked under gridded teeth. The lugs have been hollowed to lighten the watch and hide a unique case closing system with fewer visible screws. Additionally, a perforated “guidoline” leather strap has been custom made for this unique timepiece recalling the motorcycle’s custom made handlebars. The second part of this creative package is HardNine Chopper’s latest customisation: a WLC 1943 Harley Davidson 750cc that was originally owned by the Canadian Army. This mechanical piece of art has been entirely reworked by Danny Schneider during a 6 months customization process which consisted of the manual reshaping of the fenders, gas and oil tanks, the front fork, the exhaust pipe and the reconditioning of the original motor. This rumbling motorbike has also been beautifully hand painted in a purple metal flake colour highlighted by hand drawn pinstripes that have been placed on both sides of the gas tank, fenders and front fork. Like RJ-Romain Jerome’s timepieces, each detail has been thoroughly thought through to transform this historical object into a unique piece of Contemporary Art. For example, the steering column is subtly decorated, South Park’s famous “Cartman” figurine is used to manually change the bikes’ gears and the name of the hard rock group “Slayer” is cut-out on the grip of the right footstool. Additionally, the lettering “L.A” and the number “9” are hand painted on the visible parts of the motor. This unique set has already been sold. 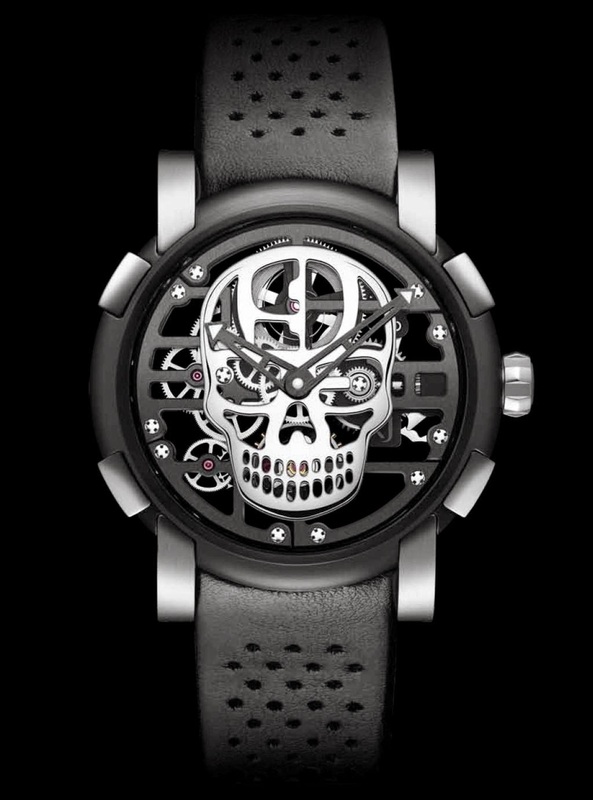 RJ-Romain Jerome has also created a limited edition of nine H9C-DNA timepieces featuring a mirror polished H9C skull on the dial, keeping the intrinsic design of the original watch in a black PVD-coated steel case.